This is the best time to buy the new 2018 Fiat Spider 124, we have models arriving all the for you to choose from! Experience the fun and freedom you’ll feel with driving your new Fiat Spider 124. The FIAT® 1.4L MultiAir® Turbo four-cylinder with twin intercoolers delivers up to 164 hp* and 184 lb-ft of torque, and can be teamed with either the standard six-speed manual or available six-speed automatic transmission. The upshot? The FIAT 124 Spider gets to peak power and torque at a much lower rpm. Real-world driving isn’t all smooth sailing. That’s why FIAT 124 Spider is equipped with a doublewishbone front and multilink rear suspension that enhances steering response and handling. Plus, its 1.4L MultiAir Turbo engine serves up great mid-range torque for easy passing when you need it most — so you can enjoy a great ride no matter what lies ahead. Classica – Classic beauty and driving pleasure in its purest form. Lusso – A car that believes you can never be too comfortable. Abarth – The authentic roadster born with a competitive streak. 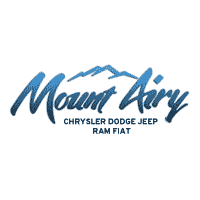 Mount Airy CDJRF is your your Fiat headquarters, stop in today today or call to schedule your test drive.